In this section of the book I move from an example-driven approach to interactive textures to a more theoretical strand in which I will set out to discuss interaction with and through interactive textures, as well as discuss interactive textures in terms of representations, navigational aids, and user interfaces. In doing so, I first start with a discussion of the role of architecture in our society and in our everyday lives followed by a discussion on textures in relation to representations as to establish a link between architecture and the area of interaction design. Here, I will specifically review the efforts made so far on bridging these two areas and mark out the conceptual “state-of-the-art” when it comes to theorizing in this area. Further on, a discussion on textures as navigational aids are initiated in which architectural thinking meets some conceptual notions from the area of interaction design. 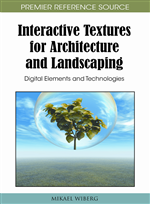 Finally, the chapter ends with some theorizing around interaction with and through textures as to fully explore a true blending of architectural thinking with interaction design reasoning. “The architecture that surround us defines a crucial part of our everyday lives. It shapes and defines the frames for our lifes, the rooms in which we live, work, socialize, do our shopping, and spent our leisure time” (Tietz, 1998, p.6). “Imagine a world without architects, where only engineers construct buildings. With a keen eye towards functionality, these engineers would make sure buildings were sound, but something would be lacking. People would miss the richness of architecture – the designed connection to their lives, history, and culture. The designed experience of these buildings would be irrelevant to their social and personal concept of buildings. Yet this is the world researchers are inadvertently creating with ubiquitous computing” Sengers, et al (2004, p. 14). This, despite the fact that several of the most recent attempts made in these areas of research focuses on design of various digital augmentations of our physical surrounding as to enable new novel place- and location-based services in support of social interaction “in the wild”, and in public places. In this book I specifically aim at addressing these new practices and this relatively new phenomenon, i.e. the current blending of building materials with interactive components which challenges us as artists, architects, designers, theorists, and geographers, to develop our language and designs towards the “use” of these environments, articulating both what it means to interact in these new modes of place, and framing interaction with and through so called “interactive architecture”. In doing so, I take as an important point of departure current literature which describes, analyses and theorize the ongoing integration of digital technologies in our built environment (e.g. Greenfield, 2006). Further on, my theoretical work on interactive textures builds upon a conceptualized understanding of the integration of architecture and digital technologies as ”Media spaces” to address how digital technologies enable us to spatially stretch places, connect places, connect to other human beings across geographical distances in the creation of so called “Media districts” (Indergaard, 2004).